Pseudodementia is understood as a specific clinical entity, characterized by cognitive deficits, mimicking dementia, occurring in the background of functional psychiatric disorders, especially depression. One of the earliest reports of pseudodementia was published by Kiloh. He considered that patients with pseudodementia are at risk of therapeutic neglect and over investigations. Kiloh described 10 cases of functional psychiatric disorders and considered pseudodementia as a purely descriptive term, which does not carry any diagnostic weight, commonly associated with depressive disorders. According to him, these patients had varying degrees of disturbances in memory, judgment, and intellectual functions such as comprehension, calculation, and knowledge. Over the years, the concept of pseudodementia has been evaluated by many researchers, and some support the existence of the same.,,,, In this report, we describe a case of long-standing pseudodementia which occurred in the background of a depressive episode and discuss the distinguishing features which can help in differentiating features between true dementia and pseudodementia. Mr. X, a 57-year-old male presented to the outpatient with a history of forgetfulness. Exploration of history revealed that the patient is symptomatic for the last 14 years. Initially, to start with, following a financial loss, he developed insidious-onset illness characterized by sadness of mood, anhedonia, easy fatigability, bleak and pessimistic views of the future, disturbed sleep, decreased appetite, low self-esteem, and suicidal ideation. For these symptoms, he was treated with antidepressants but showed incomplete improvement. He continued to experience residual symptoms, and 6 years later, again following a financial stressor, he had relapse of symptoms. This time, the symptoms were of acute onset and were similar to the first episode. In addition to depressive symptoms, he also started to report memory problems and refused to work due to cognitive symptoms, leading to frequent altercation with his spouse. However, when forced to work, he was able to manage his work, which involved handling of cash. There was no difficulty in activities of daily living or in understanding any instructions. Over the period of the next 6 years, there was significant worsening of depressive symptoms and subjective complaints of cognitive symptoms. He would remain distressed due to his cognitive symptoms and would often voice that he is not able to remember old and new things. About 2 years back, he suffered from a minor head injury, following which, in addition to the above symptoms, started remaining irritable. There was no history of apraxia, agnosia, seizures, change in speech, any neurological deficits, any psychotic symptoms, manic symptoms, and evidence of nutritional deficiency. There was no history of any physical illness, and premorbidly, he was reported to be attention seeking and to have low frustration tolerance. His treatment history revealed that he was initially seen by a psychiatrist and later by a neurologist, was diagnosed with dementia, and was treated with trials of lurasidone, sodium valproate, and olanzapine sequentially for 2–3 months at a stretch, without much improvement. Family was explained that he was not going to improve. At presentation, his physical examination was unremarkable and mental status examination showed sad affect, ideas of hopelessness and helplessness, and death wish. His Hamilton Depression Rating Scale (HDRS) score was 32 at the time of initial assessment. When attempts were made to assess the cognitive functions, he expressed severe distress with respect to cognitive problems, mostly gave “don't know” answers, did not name the common objects, but was able to use these appropriately, and gave approximate answers (for example, when asked to identify the colors, identified red as blue, shoes as socks). He did not attempt to carry out any calculations, stating that he had memory problems and will not be able to do so. On investigation, his hemogram, fasting blood sugar, serum lipids, thyroid function tests, renal function test, liver function test, electrocardiogram, serum B12 levels, and serum folate levels were within normal limits. His magnetic resonance imaging study did not reveal any abnormality. During the inpatient stay, the patient would keep on voicing about his memory problems but had no difficulty in findings ways, performing activities of daily living, and taking care of his own belongings. Based on the available information, a diagnosis of recurrent depressive disorder, current episode, severe depressive episode without psychotic symptoms with pseudodementia, and personality and behavioral disorders due to brain disease, damage, and dysfunction were considered. He was started on capsule venlafaxine 37.5 mg/day, which was gradually increased to 187.5 mg/day, along with tablet quetiapine 75 mg/day. In addition to the medication, he was administered five modified bitemporal electroconvulsive treatment sessions in view of nonresponse to antidepressants. With this treatment, there was significant improvement in his clinical status, and at the time of discharge, his depressive symptoms (HDRS reduced to 9) improved significantly and his subjective complaints of cognitive disturbance reduced significant but did not disappear completely. Over the period of follow-up of 1.5 years, he continued to maintain the improvement and functionality, albeit with residual subjective complaints of forgetfulness, but without much functional impairment. The term pseudodementia denotes occurrence of cognitive deficits in patients with psychiatric disorders, in the absence of actual neurodegenerative process. In the current scenario, when there is so much discussion about minimal cognitive impairment and depression being a risk factor or prodromal symptom of dementia, vascular depression,, and occurrence of depression among patients with dementia,, the significance of pseudodementia possibly does not exist. However, the index case highlights that a small proportion of patients still present to clinics with classical features of pseudodementia and there is a need for the clinicians to be aware of the same. As suggested by Kiloh, patients presenting with pseudodementia often face therapeutic nihilism as was experienced by the index case. Before coming to our center, he was given a diagnosis of dementia and was considered to have deteriorating course. However, in contrast to the existing literature, index case had prolonged course before being treated at our center. However, despite this, the cognitive deficits were stable and did not follow a deteriorating course. This finding further supported the notion of pseudodementia in the index case. One of the features of pseudodementia, which have been debated in the literature, includes its reversibility. There is some evidence to suggest that in all cases of pseudodementia, some cognitive disturbances may persist. Index case also highlights the similar clinical picture, who continued to experience residual depressive symptoms and cognitive complaints. Further, it is important to note that there is some evidence to suggest that the presence of pseudodementia in patients with depression increases the risk of dementia later on. 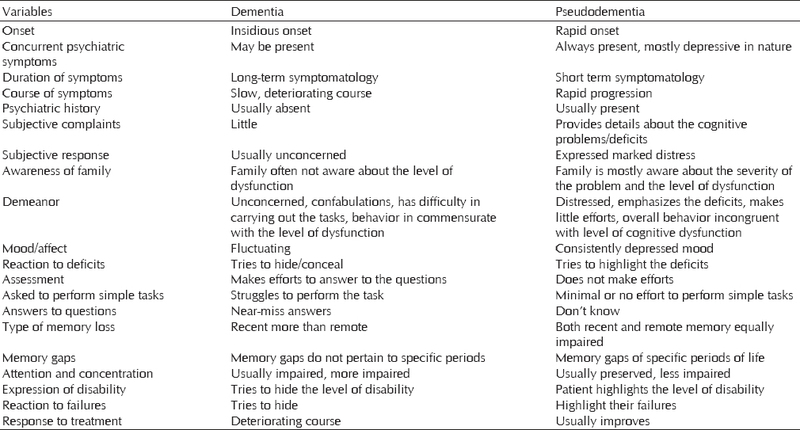 Clinically, many features have been reported to distinguish patients of pseudodementia from true dementia [Table 1]. As is evident from [Table 1], patients with pseudodementia often have impairment of both recent and remote memory, in contrast to Alzheimer's dementia, which is characterized initially by impairment of recent memory. Further, patients with Alzheimer's dementia often try to confabulate and try to minimize their deficits, whereas those with pseudodementia tend to highlight their deficits.,, In the index case, the patient often highlighted his deficits, had concurrent symptoms of depression, had marked distress due to his cognitive symptoms, did not make much effort to perform on simple cognitive tasks, and gave don't know answer to many of the questions. All these features are consistent with pseudodementia. Till recent times, none of the studies systematically evaluated the differences in the cognitive profile and neuroimaging findings of patients with true dementia and pseudodementia. A recent study showed that there are significant differences between patients with Alzheimer's dementia and depressive pseudodementia in terms of Wechsler Memory Scale, Clock-drawing test, Stroop test, Boston Naming Test, and Mini-Mental State Examination scores and left hippocampal volume. Some authors use the term pseudo-pseudodementia when the patient presents with features of pseudodementia in the background of organic brain disease. In the index case, the patient had cognitive symptoms suggestive of pseudodementia before suffering from head injury. Hence, we did not consider the cognitive syndrome as pseudo-pseudodementia. Among the various differential diagnoses of pseudodementia, a possibility of malingering should always be kept in mind. It is suggested that patients with malingering are usually on guard and appear anxious while being evaluated. Further, they often become irritable when confronted. Patients with malingering are also often not cooperative for full examination (Lishman, 1978). In the index case, the patient was cooperative for examination and keep on giving don't know answers rather than getting irritable. Hence, malingering was ruled out. The index case suggests that although the current literature focuses on various relationships between depression and dementia, the existence of pseudodementia should not be forgotten and a careful history and clinical examination may be sufficient to consider the possibility of pseudodementia. Wells CE. Pseudodementia. Am J Psychiatry 1979;136:895-900. Kiloh LG. Pseudo-dementia. Acta Psychiatr Scand 1961;37:336-51. Bulbena A, Berrios GE. Pseudodementia: Facts and figures. Br J Psychiatry 1986;148:87-94. Caine ED. Pseudodementia. Current concepts and future directions. Arch Gen Psychiatry 1981;38:1359-64. Khanna S, Jee A. Schizophrenic pseudo pseudo dementia – A case report. Indian J Psychiatry 1988;30:307-9. Kang H, Zhao F, You L, Giorgetta C, Venkatesh D, Sarkhel S, et al. Pseudo-dementia: A neuropsychological review. Ann Indian Acad Neurol 2014;17:147-54. Petersen RC, Lopez O, Armstrong MJ, Getchius TS, Ganguli M, Gloss D, et al. Practice guideline update summary: Mild cognitive impairment: Report of the Guideline Development, Dissemination, and Implementation Subcommittee of the American Academy of Neurology. Neurology 2018;90:126-35. Almeida OP, Hankey GJ, Yeap BB, Golledge J, Flicker L. Depression as a modifiable factor to decrease the risk of dementia. Transl Psychiatry 2017;7:e1117. Loganathan S, Phutane VH, Prakash O, Varghese M. Progression of vascular depression to possible vascular dementia. J Neuropsychiatry Clin Neurosci 2010;22:451-t.e34-451.e35. Alexopoulos GS. Vascular disease, depression, and dementia. J Am Geriatr Soc 2003;51:1178-80. Kitching D. Depression in dementia. Aust Prescr 2015;38:209-11. Sáez-Fonseca JA, Lee L, Walker Z. Long-term outcome of depressive pseudodementia in the elderly. J Affect Disord 2007;101:123-9. Sahin S, Okluoglu Önal T, Cinar N, Bozdemir M, Çubuk R, Karsidag S. Distinguishing depressive pseudodementia from Alzheimer disease: A comparative study of hippocampal volumetry and cognitive tests. Dement Geriatr Cogn Dis Extra 2017;7:230-9. David AS, Fleminger S, Kopelman MD, Lovestone S, Mellers JD, Folstein M. Lishman's Organic Psychiatry: A Textbook of Neuropsychiatry. 4th ed. West Sussex: Wiley-Blackwell Ltd.; 2009.